탈춤이란 한 사람 또는 여러 사람이 가면으로 얼굴이나 머리 전체를 가리고 다른 인물, 동물 또는 초자연적 존재(신) 등으로 분장한 후 음악에 맞추어 춤과 대사로써 연극하는 것을 말한다. 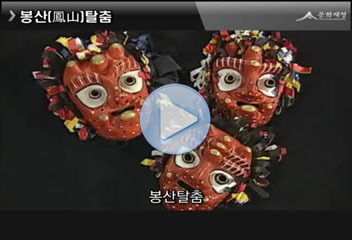 탈춤은 조선 전기까지 각 지방에서 행해지던 가면놀이이다. 17세기 중엽에 이르러 궁중의 관장하에 “산대”라 불리는 무대에서 공연되던 산대도감극(山臺都監劇)의 형태로, 인종 12년(1634)에 궁중에서 상연이 폐지되자 민중에게 유입되어 전국으로 전파되었다. 봉산탈춤은 약 200년전부터 매년 단오와 하지날 밤에 행해졌다. 놀이는 4상좌춤·8목중춤·사당춤·노장춤·사자춤·양반춤·미얄춤의 7과장으로 구성되어 있다. 놀이에 앞서 가면과 의상을 갖추고 음악을 울리면서 공연장소까지 행렬하는 길놀이와 제사를 지낸다. 등장인물은 상좌·목중·거사·사당·노장·신장수·원숭이·취발이·샌님·서방님·종가집 도련님·말뚝이·영감·미얄·남강노인·무당·사자 등 모두 36명이며, 탈은 27개가 사용된다. 서민들의 가난한 삶과 양반에 대한 풍자, 파계승에 대한 풍자, 그리고 일부다처제로 인한 남성의 여성에 대한 횡포를 보여준다. 피리·젓대·해금·북·장구 등으로 구성된 삼현육각으로 연주하는 염불과 타령·굿거리곡에 맞추어 추는 춤이 주가 되며, 다른 가면극에 비해 중국 한시구절의 인용과 모방이 많은 것이 특징이다. 봉산탈춤은 황해도 전역에 걸쳐 분포되어 온 해서탈춤 가운데 가장 잘 알려진 탈춤으로, 다른 탈춤에 비해 춤사위가 활발하며 경쾌하게 휘뿌리는 장삼 소매와 한삼의 움직임이 화려하게 펼쳐진다. 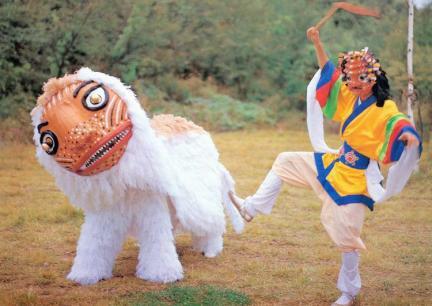 Mask dance is a stage play wherein one person or several people wearing a mask act as a person, an animal, or a supernatural being (god), delivering a message with dialogues or dances. 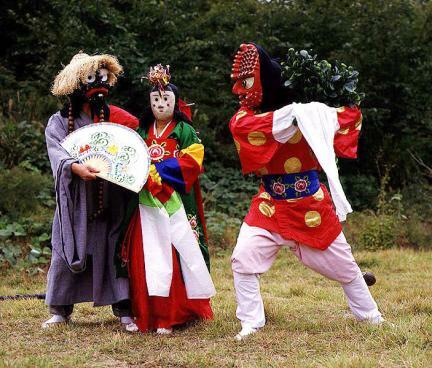 Talchum (mask dance) was performed throughout the country until the early Joseon Period. 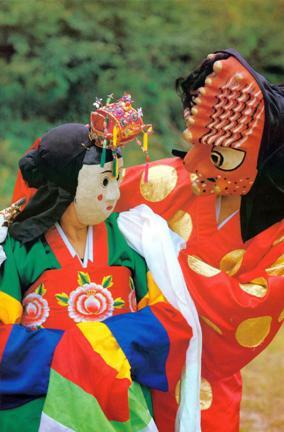 When the Sandae (type of mask dance) was no longer performed in the Royal Palace, it was enjoyed as a pastime by ordinary people. 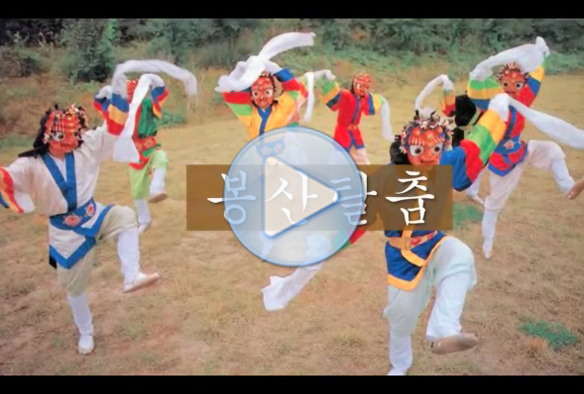 Bongsan Talchum was started in Bongsan-gun, Hwanghae-do about 200 years ago. 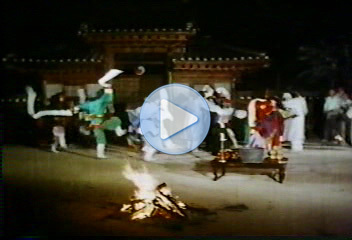 Performed on the night of Dano (fifth day of the fifth lunar month) and Haji (Summer Solstice), it is composed of dances associated with four monks, eight monks in black robe, a female member of a troupe, an old monk, a nobleman, and an old wife. 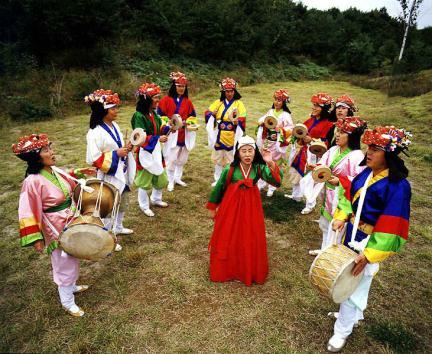 Prior to the start of the play, the 36 members of the play (27 of them wearing masks) march to the site of the play while playing music. They also hold a sacrificial rite. 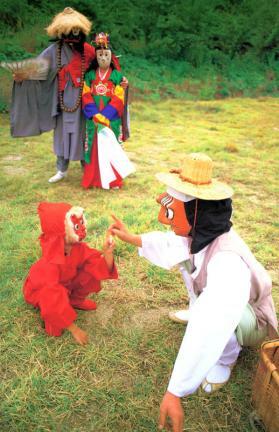 The play contains satire about nobles harassing commoners, depraved monks, male chauvinism in a custom of allowing a man to take many wives, etc. 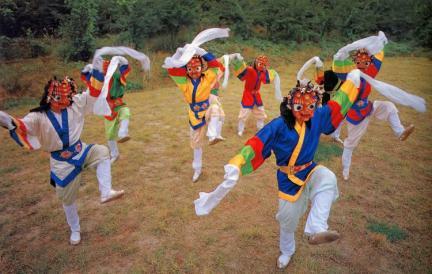 Members dance to the tune of praying to Buddha, taryeong (Korean folk song), and gutgeori rhythm songs accompanied by the playing of samhyeon yukgak (three strings and six wind instruments) such as piri (flute), jeotdae (bamboo flute), haegeum (two-stringed fiddle), buk (drum), and janggo (hourglass-shaped drum). 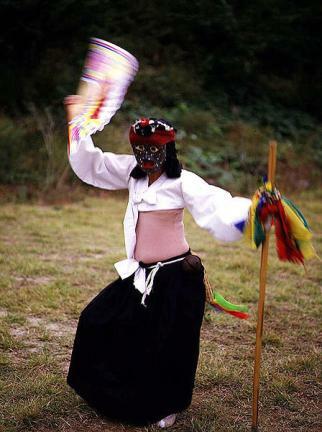 Compared to other mask dances, this one features the frequent citation of Chinese poems. 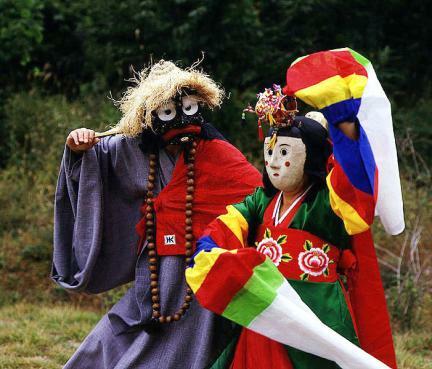 As the best known among the mask dances handed down in Hwanghae-do, Bongsan Talchum displays the lively movements of dancers including the shaking of the sleeves of the robes.